After decades of war and revolution, a communist country looks increasingly like the capitalist countries it fought against. Having lived and worked in Vietnam for a year now, I have only a slightly better understanding of the country than when I first arrived. This is a country of extremely complex paradoxes and antagonisms. I remain dumbfounded by the disparities, hypocrisies and corruption that are endemic at every level of every institution. One could argue this is a common feature of all nation-states and market-oriented societies, and this may be true. But for one styling itself as socialist, run by a communist party with a firm monopoly of political power, these features seem even more maniacal. Not long after my arrival in Hanoi, I began thinking that a mood of entropy emanates from the entire city–it is a totally schizophrenic metropolis. We are told it is the dawning of the Asian Century. The global balance of power is shifting again towards the East. The economic powerhouses of China, India, South Korea, and Taiwan, put recession-hit European and American markets to shame, with GDP growth rates consistently pushing towards double figures for the last decade. China has capitalized fully on its vast army of cheap labor and the internal migrati on from the countryside to burgeoning megacities. An authoritarian, one-party state keeps a tight lid on its power, paying lip-service to Marx, Mao and Lenin while simultaneously welcoming economic liberalization, foreign direct investment, and the heady world of globalization. As the developed economies in the West struggle to pay off their international creditors and manage their structural deficits, the Asian Tigers enjoy a boom. Vietnam’s leaders, predictably, also want a piece of the pie. Almost forty years after the withdrawal of US troops from Saigon, the Communist Party-Vietnam (CPV) continues along the same path it has pursued since the doi moi reforms announced in 1986. Comparable in sum and substance to China’s Deng Xioping’s restructuring towards a “socialist-orientated market economy,” Vietnam’s doi moi policies amount to an abandonment (or, as the government says, a temporary hiatus) of some of Marxism’s core tenets. These include a discarding of the previously unassailable principle of central planning and collectivization in industry and agriculture, and instead embracing what was once anathema–economic liberalization, modernization, and globalization. Far from being nominal or abstract, the reforms manifest themselves in very visible ways. The highway between Hanoi’s airport and the city centre is edged with gigantic billboards looming over rice paddies, advertising banks, cars, and mobile phones. The country’s northern capital has long been at the mercy of its traffic, but its clogged arteries are increasingly filled with imported Bentleys, Porsches, and 4x4s, the vehicles of choice for the nouveau riche despite a tariff of 80 percent on automobiles. Giant billboards that cover French colonial buildings in the old quarter are adorned with a Big Brother-esque portrait of Steve Jobs with the tag-line, “Think Different.” Presumably, the country’s rulers hope the slogan isn’t taken too literally. 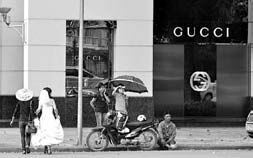 In the richer districts, gaudy communist propaganda sits uncomfortably beside Gucci posters and designer fashion outlets. While the majority pay for public education and healthcare, the propertied classes send their children to private English language schools to ensure their class position and relative wealth is protected for their progeny. Conspicuous consumption is the order of the day, with a new generation keen to flaunt money and consumer goods of which their grandparents could only dream. All the paradoxes of modern capitalism, the inequities, discords and antagonisms produce a dissonance as unmistakable in this ostensibly socialist republic as in any capitalist mecca. The brazen contradiction between official Party doctrine and its actual practice is perhaps best encapsulated in the name of Vietnam’s “Ho Chi Minh Stock Exchange.” Now, the great leader’s near-ubiquitous image has to compete for space with the Apple logo and the Los Angeles Lakers’ emblem. And, as Uncle Ho lies in his air-tight glass coffin, with lines of backpackers, tourists, and Vietnamese faithful filing past in neat, reverent succession, how would he interpret the state of his country today? One suspects he’d be turning in his transparent grave like a rotisserie chicken. The posters announcing the annual Labor Day celebrations come complete with a sponsor–Vietcom Bank. Just outside the city, a private gated community (named Ciputra, after its Indonesian property-mogul owner) complete with luxury apartments and fast-food outlets is populated by expats, businessmen, and high-ranking government officials. Outside a KFC in the city centre, rubbish collectors and fruit sellers struggle to make a living in a country with an equality ranking lower than Niger and Tanzania’s. Flashback to 1976, a year after the withdrawal of US troops from Saigon, and the newly-unified country is embarking upon a process of forced collectivization, nationalization, and “reeducation-through-labor” for those Vietnamese who fought for the Southern army and their American counterparts. An exact figure of 58,220 American deaths; around 1,000,000 to 3,000,000 Vietnamese deaths (but those are rarely tabulated). Approximately half a million Cambodian and Laotian deaths, but again, who’s counting? Millions dead by any measure, in a proxy war between competing superpowers. Victims of the great geopolitical game that was the Cold War. One bloc trying to prevent the feared, “domino effect,” the other trying to provoke the dominos’ fall. In their rhetoric, each had a seemingly unique orthodox creed, but one that concealed the real principle both blocs held in common-the pursuit and perpetuation of their own power. Between the American army with their Thai, Australian, and South Vietnamese allies, and the North Vietnamese army, with their Russian and Chinese allies, there is no side to be taken. When faced with two options, always choose the third. A plague on both their houses. The Vietnam conflict was a protracted civil war exacerbated by foreign military intervention. No doubt without the presence of US troops, Saigon would have quickly been captured by the communists. Similarly, without the backing of China and the Soviet Union, the communists would have found it difficult to withstand the onslaught of American firepower. It was in this sense a surrogate war, a chess board for nuclear-armed states, for whom a direct conflict meant mutually assured destruction. Vietnam was their go-between. And, to the victors belong the spoils. The US military suffered humiliating defeat for the first time and at the hands of a peasant army. A superpower ousted by a national liberation movement in full view of the press corps. Or, so the official narrative goes. Vietnam’s national pride and America’s international embarrassment. In today’s Vietnam, where three-quarters of the population were born after 1975, history is manipulated and used as a tool, a justification for the continued rule of a dictatorial elite, parasites on a memory embedded into the national consciousness, a memory altered and framed a posteriori, and then proliferated by a ruling class keen on continuing their dominance into posterity. The memory of war legitimizes them and consolidates their power. Incontestable deference and acclaim for those who fought off imperialist invaders–The Party which fought off French, Japanese, and American occupiers, and who first established Vietnam as an independent nation, must certainly know what’s best. But their time will come. An Asian Spring is near. The Party’s grip on power depends on their ability to sustain high growth rates and employment. But as demand for exports dries up, there are signs of stress in an economy nearing the end of a credit and property binge. Once this warped social contract is broken, who knows what form a post-CPV Vietnam will take. With hindsight, (and forgive the historical revisionism, it is without an ounce of glee or triumphalism) if anyone actually “won,” it was the American invaders. The US wanted Vietnam, or at least the South, to remain a capitalist puppet state as a bastion against communism in the region. Today, Vietnam is a capitalist state in a region of capitalist states. The socialist experiment failed and now they’re open for business. When it comes to Vietnam’s territorial disputes with China (namely over the Spratly islands), America increasingly supports its old enemy as a buttress against Beijing, its main economic competitor. But in wars between political states, the number of losers far outweigh the number of winners. It is the poor who fight the wars of the rich, and it is obscene to try and identify winners or losers in a conflict that left as many as five million dead. Perhaps the most accurate analysis would be that Vietnam saw decades of conflict in which nobody really won. The victory of the Stalinist CPV didn’t equal emancipation for the Vietnamese. Nor would an American victory have been much different. Political opposition is routinely suppressed, human rights campaigners and bloggers jailed, and reformist organizations such as Viet Tan labeled as “terrorists.” Land evictions are violently resisted by the local population as the government tries to auction off sites for new developments, resorts and gated-communities. None of this is reported in the state-controlled media. Vietnam is a country of such glaring and unsustainable internal contradictions that it cannot remain in stasis. The corruption of its leaders does not go unnoticed by tech-savvy youths who bypass the block on social networks, nor by rural farmers (comprising a majority of the population) who can see first hand that the Party line doesn’t hold water. The nonsense of quasi-Marxist spin is laid bare when you’re forcibly removed from your home to make way for a golf course. It shouldn’t be long before localized resistance develops into general insurrection. Jonny Ball is an English teacher in Hanoi. He is originally from Liverpool, England. See letter responses, FE #389 and #390.